The International Association of Baggage System Companies (IABSC) is an organization committed to improving the Airport/Airline Industry in areas associated with Baggage Handling Systems (BHS). The IABSC provides a voice and education opportunities to BHS professionals, as well as implementing standards and working with other industry leaders to improve the development of the BHS industry worldwide. Unified Supply is a member in good standing of the IABSC. 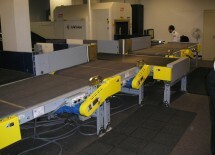 The membership provides Unified Supply a role in the long-term development of the Baggage Conveyor Industry, as well as access to the latest best practices used industry-wide.